Celebrate SG51 with Maguro Donya's Festive Red & White Maguro Don + Sushi Set! Enjoy this set for only $51 for 2 pax! Set consist of the best, highly prized sashimi & sushi grade Maguro. Consist of 3 Hon Maguro parts - Akami (normal red tuna meat), Chutoro (medium fatty tuna) and lastly Ootoro (the fattiest and nicest part of the tuna belly). Simply a must-try! Consist of 3 type of beautiful color Mebachi-Maguro, Squid, Scallop, Kanpachi (Greater Amberjack) Sushi, forming a mix of Red and White; definately a must try for this National Day! BONUS: Why should you try Membachi Maguro? It is the season for Mebachi Maguro! Do not miss the chance to savour the freshest and juiciest Mebachi Maguro! J Passport members, click SAVE to get this at a special price! Festive Red & White set promotion valid till 31st August 2016. Complimentary set for 2 valid for every Monday only for Festive Red & White set. Management reserves the rights to amend or terminate offer at any one time without prior notice. Prices are subjected to prevailing GST and Service Charge. Wanna find out more promotions and the latest updates from Maguro Donya? Join Maguro Donya's FREE membership now and receive a welcome treat! FREE 1pc Ootoro Nigiri Sushi (Fatty Tuna)! You haven't truly experienced MAGURO till you try this! This month, enjoy the chef's recommended BEST OF MAGURO PARTS Set Menu for only $58++ (U.P. $92++)! The set combines two of the best, highly-prized Maguro parts: Otoro Sashimi & Kama Yaki! If you’re a Japanese food lover, otoro’s certainly no stranger to you! 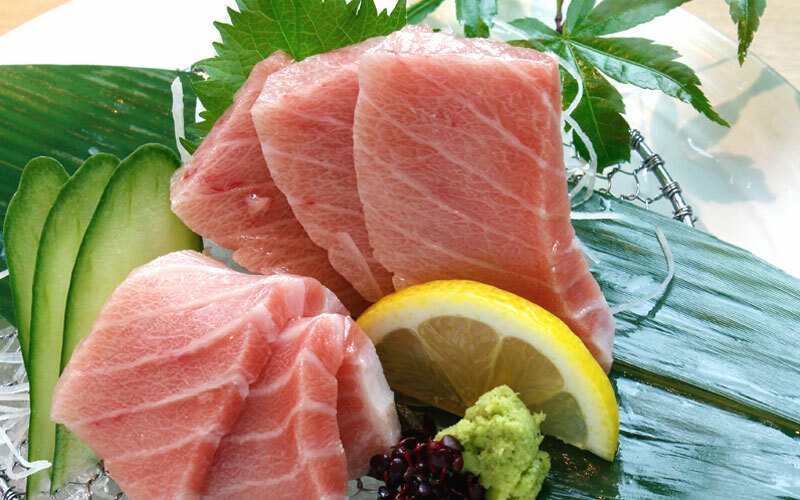 Otoro is the fattiest part of tuna belly, which is rich with omega 3 and melts in your mouth. No wonder it’s the most prized maguro part! Here’s another highly prized maguro part that you may have never tried before: kama (collar meat)! Grilled with special sauce, the maguro collar provides the perfect combination of crispy and juicy: crispy, smoky skin outside and a juicy maguro flesh inside. Simply a must-try. If you're a sashimi lover, you've definitely tried the hot favourite OOTORO and CHUTORO fatty Maguro! But have you heard of Queen-toro? A little trivia: "Ootoro" is also known as "King-toro"! Thus, Queen-toro is the small tender part that comes between Ootoro & Chutoro. This part is really small and limited in every Blue-Fin Maguro, so it is really rare! You can also get FREE egg custard, miso soup, salad & fruits every Monday! As it is very limited in quantity, Queen-toro will only be sold as part of J Passport Exclusive Queen-toro Don Set Menu. Ootoro Sashimi & Chutoro Sashimi is also available from our usual menu, at $58++ and $39++ respectively. We are happy to see more and more people coming to MaguroDonya to enjoy fresh Maguro dishes! To thank you for your support, exclusively for J Passport members, enjoy the best of Maguro with 50% OFF MaguroDonya Premium Sushi Omakase Set! With fresh Hon Maguro, Anago, and Kanpachi freshly imported from Misaki Port, enjoy one of the best and freshest sushi selections in town! On Monday, you can also enjoy Complimentary Egg Custard, Miso Soup, Salad, and Fruit. Exclusively for J Passport members, you can enjoy Premium Sushi Omakase Set for only $24.50++ (50% OFF! U.P. $49++)! Coming directly from the sea or fishermen's hands to the dining table, you can enjoy the freshest Maguro and seafood at the best affordable price! All the fishes are flown in 3 times a week from Misaki Port, fresher than Tsukiji Market! Do you know that Maguro is good for deep-frying too? As the pioneer in Maguro (tuna) wholesale from Japan, Maguro Donya serves fresh Maguro and seafood dishes daily, directly flown from Misaki Port, Japan! Exclusively for J Passport members, you can enjoy Mega Maguro Katsu Don for only $18.80++ (1.5x SIZE for the price of 1x)!